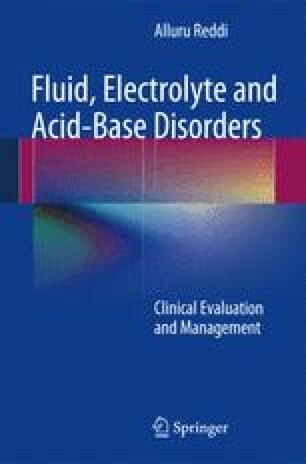 Measurement of urine Na+, Cl−, and K+ is rather common in hospitalized patients, and these urine electrolytes are useful in the diagnostic evaluation of volume status, hyponatremia, acute kidney injury (AKI), metabolic alkalosis, hypokalemia, and urine anion gap (urine net charge). A spot urine sample is generally adequate for determination of these electrolytes. In addition, urine creatinine is determined to calculate the fractional excretion of Na+, K+, or other electrolytes. Also, urine osmolality is helpful in the differential diagnosis of hyponatremia, polyuria, and AKI.